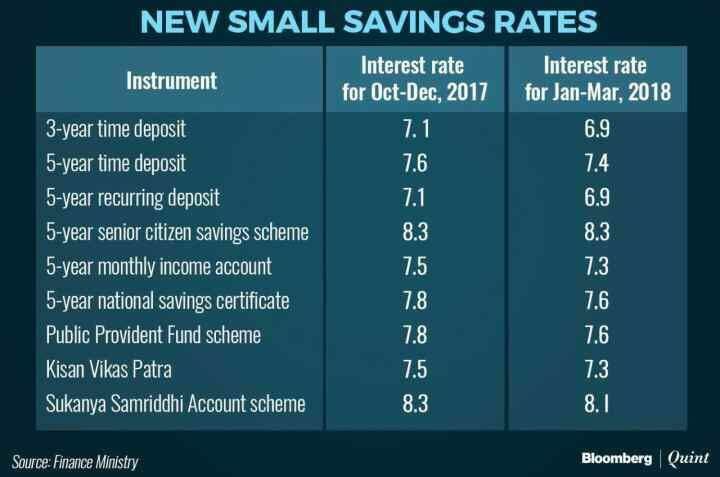 The government slashed interest rates on small savings schemes, including NSC and PPF, by 0.2% for the 2018 January-March period from the rates applicable in the previous quarter, a move that will prompt banks to lower deposit rates. However, the interest rate in the 5 -year Senior Citizens Savings Scheme has been retained at 8.3%. The interest on the scheme is paid quarterly. A Finance Ministry notification said rates have been reduced across the board for schemes such as National Savings Certificate, Sukanya Samriddhi Account, Kisan Vikas Patra and Public Provident Fund (PPF). However, the interest on savings deposits has been retained at 4% annually. As per the notification, PPF and NSC will fetch a lower annual rate of 7.6% while KVP will yield 7.3% and mature in 11 months. The girl child savings scheme, Sukanya Samriddhi Account, will offer 8.1 % against the existing 8.3% cent annually. Term deposits of 1 to 5 years will fetch a lower interest rate of 6.6 to 7.4%, to be paid quarterly, while the 5 year recurring deposit is pegged at 6.9%. “On the basis of the decision of the government, interest rates for small savings schemes are to be notified on a quarterly basis,” the ministry said, while notifying the rates for fourth quarter of financial year 2017-18. Term deposits of 1 to 5 years will fetch a lower interest rate of 6.6 to 7.4%, to be paid quarterly, while the five-year recurring deposit is pegged at 6.9 per cent. “On the basis of the decision of the government, interest rates for small savings schemes are to be notified on a quarterly basis,” the ministry said, while notifying the rates for fourth quarter of financial year 2017-18.